Wholesome & Balance Living. Simply. I love kale. It’s green, delicious, and loaded with nutrients. I have been in search of a good kale chip recipe for awhile. I tried many before arriving — and stopping — at this one, offering a balance of sweet and salty. Tear the kale leaves and wash well. 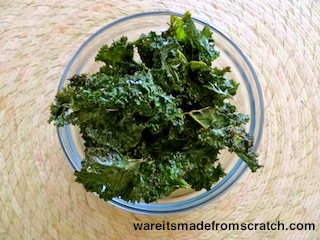 Spread the kale leaves on a cooking sheet and bake at 325 degrees for about 25 minutes. Follow Ware It's Made From Scratch by entering your E-mail address and getting the latest updates sent straight to your inbox. Stop by and see what we’re up to on Facebook.